How many ways do you make a grilled cheese? Old School - Cheddar cheese on basil buttered grilled texas toast. BOOMstick - Cream cheese blended with pickled jalapenos and Cayenne pepper. Topped with hot sauce and habanero ghost pepper pepper jack cheese on basil buttered grilled texas toast. Baron - Swiss cheese with sauteed mushrooms, sauteed onions and apple wood smoked bacon on basil buttered light rye. 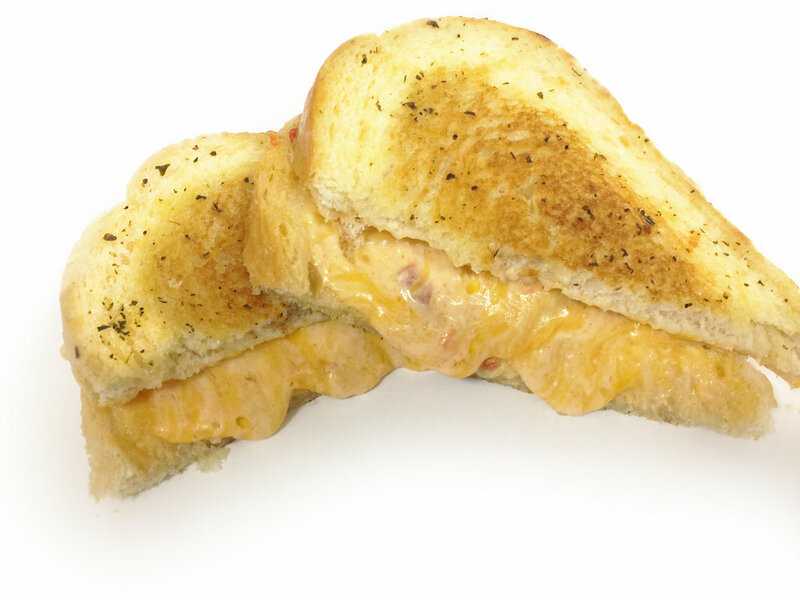 Caviar of The South - Pimento cheese topped with apple wood smoked bacon on grilled sourdough. Los Pollos - Buffalo style pulled chicken with cheddar cheese, sauteed onion, pickle and ranch on basil buttered grilled texas toast. Sweet Goat - Goat cheese blended with sun dried tomato, cream cheese and italian seasoning. Topped with fresh basil and a drizzle of honey on basil buttered grilled sourdough. BLT & Cheese - Apple wood smoked bacon with tomato, crispy lettuce and cheddar cheese on basil buttered grilled sourdough. All Choked Up - Artichoke, spinach and parmesan blended with cream cheese, topped with provolone cheese on basil buttered grilled sourdough. Royale - BBQ pulled pork topped with creamy mac & cheese & cheddar cheese on basil buttered grilled texas toast. Pork Bowl - Famous tots, Mac n cheese, cheddar cheese, BBQ pulled pork, more cheddar cheese and jalapenos in a bowl. Pollo Bowl - Famous tots, mac n cheese, cheddar cheese, buffalo pulled chicken, more cheddar cheese, dill pickles and ranch in a bowl. Loaded Tots - Famous tots topped with cheddar cheese, pickled jalapeno, bacon and hot sauce. Famous Tots - Deep fried tater tots with our special seasoning. White Cheddar Cheese Curds - Deep fried white cheddar cheese inside a light, crispy panko breading that goes crunch with every bite. Served with a side of ranch. Creamy Mac and Cheese - Elbow macaroni with a five cheese bechamel sauce. Tomato Soup - Creamy tomato soup with roasted tomatoes and shallots, topped with swiss cheese and house made croutons. Loaded Mac - Creamy mac and cheese topped with bacon, pickled jalapenos and hot sauce.